Have you ever considered the impact FOV has on your FPS ‘gaming experience’? Do you even know what FOV is? Don't worry friend, I'll try to break it down for you in this simple FOV guide that will have you stomping on your opponents from all sides before they even know what hit em! Let's play spot the difference. Look closely at the second screenshot - what are the benefits of the wider FOV? 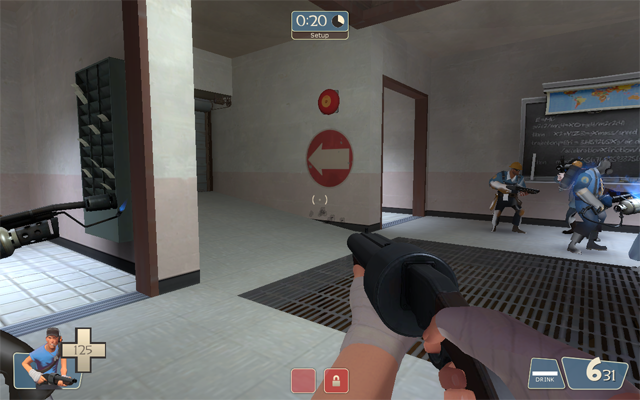 Well clearly you get more information, we can see a Scout, a Medic AND a supply cabinet which we couldn’t see before. It might not seem like a lot, but if you can see more, you’re generally going to have a better time in-game. And by a better time I mean more frags, and more frags means more FUN. A larger FOV should also look more natural to you, because in real life, our field of view is just under 180 degrees. That means we should be able to see everything in front of us, except for what is in the edges of our peripheral vision. A natural looking FOV is not an option for 4:3 monitor users, because human sight is not restricted to a box shape. So if you’re not privileged enough to own a widescreen then there’s no need expand your FOV beyond what looks reasonable, although you can still enjoy the fruits of a larger field of view. Although we’ve had widescreen desktops for a long time now, developers still stick to a narrow field of view. It is true that most FPS games come with an adjustable setting, but it’s also true that most gamers do not know how to alter their field of view, and console gamers are stuck with whatever they're given. So here's the thing: the result of a more true-to-life FOV is more immersion because movement will feel more natural and life-like. Developers of First Person Shooters should be trying to replicate the human field of view, because that will deliver a genuine ‘first person’ experience. Get it? When we want to focus on an object in real life, we turn our head and eyes to it so it’s near the middle of our field of view. In games with a narrow field of view there is no sense of depth, and what you're looking at will feel more like a moving 2D picture rather than a 3D world, due to a lack of panorama. Panorama is necessary in creating a 3D feel. A greater field of view will enable you to better calculate the angles and aid the aiming of projectile based weapons. 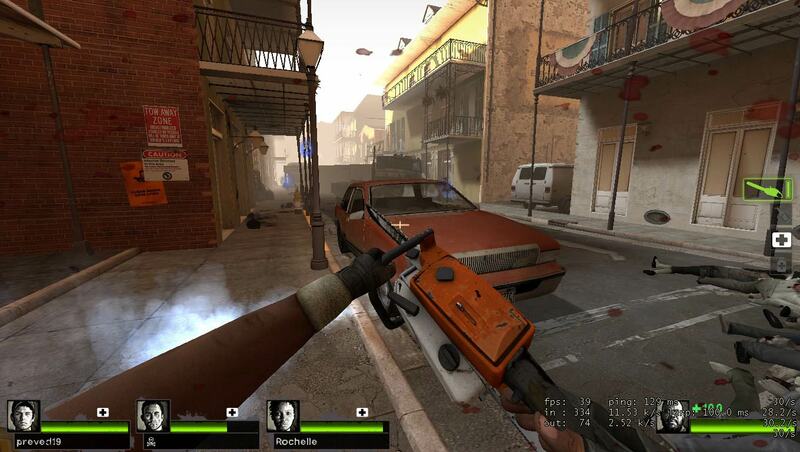 Panorama in FPS games will enable you to... a) get much more focus on what you’re aiming at b) move with more purpose, as you see objects passing in your peripheral vision. This is true especially in games with fast movement, flying or strafe jumping. If you think I’m crazy, and that an expanded field of view couldn’t possibly improve your play that much, then think again. Try it yourself. Locate your settings.ini file in your My Documents/BFBC2 folder (in Windows XP) and open the file with notepad. You have to change the ‘fov’ value, I recommend 100 in this game. Once you’ve changed it, close notepad and click ‘Yes’ to save changes. This is a touchy subject in the world of Call of Duty. The setting is virtually invisible and an both games have a hard-coded FOV of around 80. The aim is to make multiplayer fair; if everyone has the same field of view then no-one has an advantage. You can apparently hack your singleplayer FOV, but I’ll leave that research up to you. Any id Software title will allow you to change your field of view through the console command cg_fov x. Happy fragging. Ah Valve Software, one of the few developers who understands a player’s need to mess with his settings. 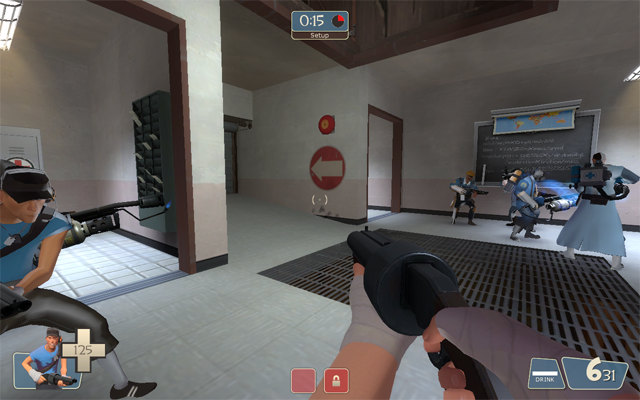 A recently added console command, cl_viewmodelfovsurvivor, can be set between 1 and 128 (default is 51). Now those zombies won’t be able to eat your ears for lunch, because you’ll be able to see see what’s coming from the sides. Eyefinity is gaming technology from graphics card manufacturer ATI. 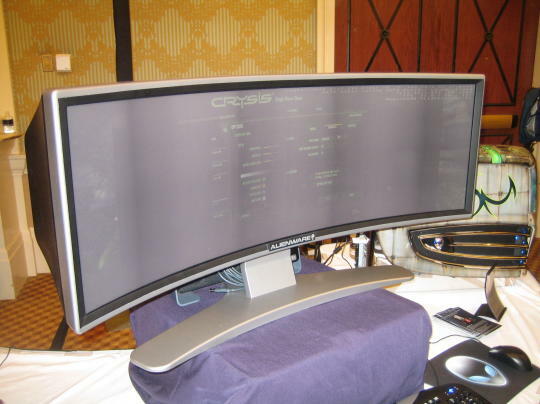 It allows you to streamline three standard monitors together, ATI says Eyefinity "creates ultra-immersive visual environments for the ultimate panoramic computing experience." As you can see from this picture, Eyefinity looks pretty sweet running Bad Company 2. And if you don't mind the black borders of the monitors (which apparently the mind ignores) then it's a great option if you want huge FOVs and you're stinking rich. Eyefinity is built into ATI graphics cards, and could cost you up to $1000 - depending on how much juice you want. Unsurprisingly, this product never saw the light of day. 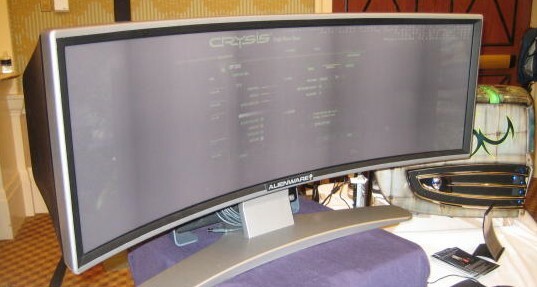 Running off an, even then, out-dated rear-projection system at a humble resolution of 2880 x 900, this curved panoramic display promises a high level of immersion as it occupies a larger slice of YOUR field of vision. The monitor was not released, and we won't see anything like this until there is a demand for the panoramic experience, which is remains a huge luxury. Not to mention the fact that it has little practical use apart from gaming. Would this be too akward for desktop browsing and watching movies? Perhaps, but at least it shows that some hardware manufacturers out there understand the need for a bigger field of view in gaming.